The Manhattan at the Georgian Room Lounge is served in the Sherlock Pipe cup. Specifically designed glassware can enhance the drinking experience, and even the flavor, of particular libations. From her vantage point behind the bar at the Georgian Room Lounge, Lead Bartender Erica Gantt reaps the rewards of her work as she watches guests’ eyes follow one of her elaborate cocktails as it makes its way across the lounge to the intended imbiber. “What’s that drink?” they ask, intrigued by the presentation, and ultimately ordering it for its look alone. She knows what attracts them to a particular beverage. It’s the same thing that comes to mind when guests reminisce about a memorable cocktail they once had, and ask if she could re-create it. Often, they don’t remember what spirits or muddled fruits and herbs were combined to make the drink they so enjoyed. What they do remember, most vividly, is the vessel the cocktail arrived in. “I’ve always known glassware to be something special,” Gantt says. That’s why she keeps a registry of cocktail recipes that includes the type of glassware the cocktail was served in. The Mini Cat coupe glass features a straw shaped like a winding tail. In fact, Austria-based glassware company Riedel built a reputation on similar claims. Years ago, the company revolutionized wine drinking by carefully designing glasses for specific varietals with the idea that distinct shapes would not only provide a superior nosing, but also direct the wine to the exact location on the palate to give the most optimal initial taste. When Riedel ventured into making cocktail glasses that offer distinct benefits to spirits drinkers, the company created the Bar Drink Specific Glassware collection, giving careful attention to the size, shape, volume and capacity for ice for six classic cocktail glasses. For example, the highball and rocks glasses are made to accommodate both the standard ice cube as well as large-format ice, and the fizz glass was made to perfectly capture the frothy and pillowy “push pop” head of foam at the top without it spilling over the rim. Even the sour glass is designed to deliver the strong flavor profile to the tip of the tongue, where the cocktail can be most enjoyed. The subtle details of the classic cocktail glassware may go unnoticed by the average imbiber. But some drinking vessels—like cocktails themselves—seem to scream for attention. That unexpected touch is the kind of thing that turns heads and leaves an impression in members’ and guests’ minds, Gantt says. The Sea Urchin glass is a prime example: It’s a clear, spiny orb that looks impossible to hold but somehow balances on its bottom spikes when set atop a table. It’s the vessel for the Under the Sea cocktail that is served in the Georgian Room Lounge. 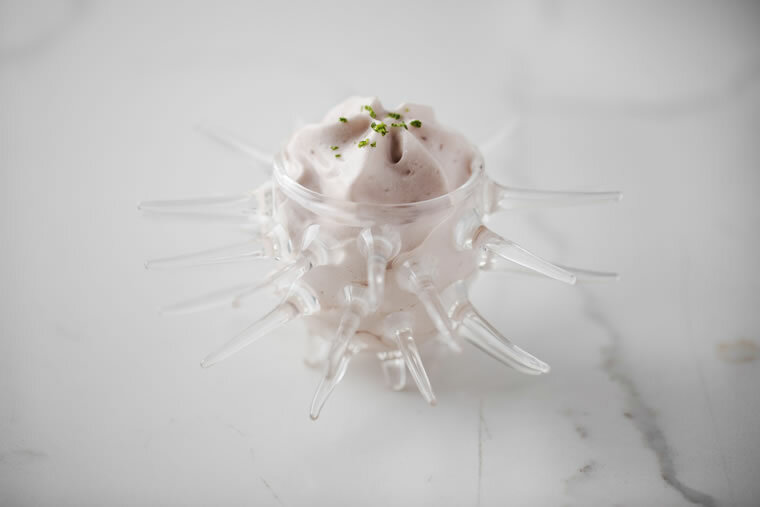 The “edible” cocktail is made with whipped egg whites and sprinkled with Pop Rocks candy, giving it a “bubbly texture almost like sea foam,” she says. The Under the Sea cocktail has a texture similar to sea foam and is served in the Sea Urchin glass. 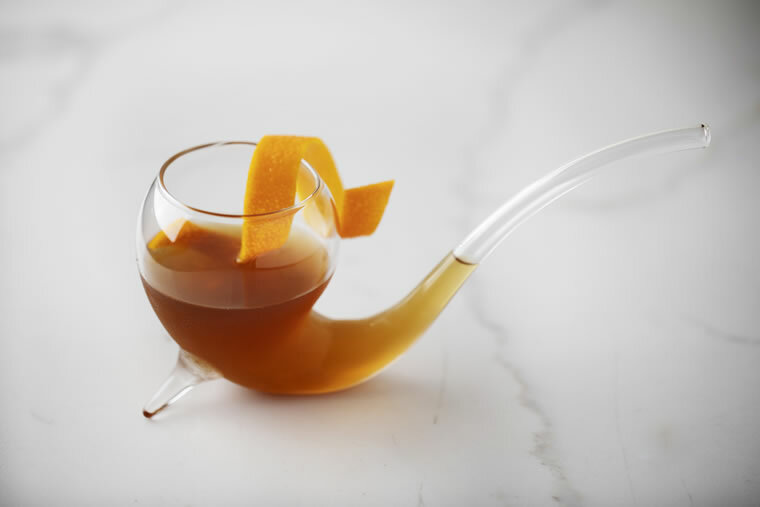 The Georgian Room Lounge’s seasonal Manhattan is also served in a remarkable contraption called the Sherlock Pipe cup. As its name suggests, the vessel is shaped like a calabash gourd pipe (Sherlock Holmes’ preferred smoking device) with a wide bowl and a thin tube rising up from its base. The beverage can either be enjoyed straight from the bowl, or sipped from the pipe end. Gantt even infuses cherry tobacco smoke into the cocktail to round out the smoking pipe effect. Another favorite vessel seen at the resort is the Mini Cat coupe, which features a straw shaped like a winding tail. 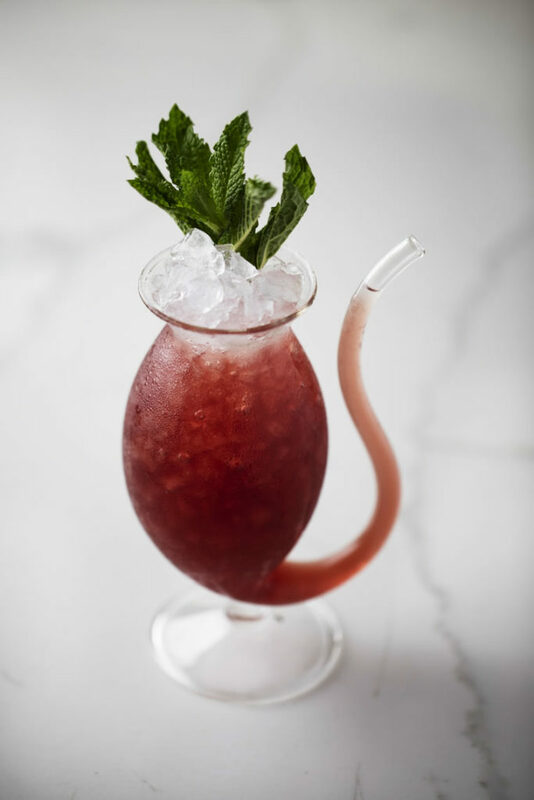 This coupe makes a great delivery system for tropical rum drinks, layered beverages and Nana’s Cobbler, another cocktail that is served at the lounge, which is crafted with homemade fruit cobbler.